My mother-in-law deserves a medal for all the babysitting duties she takes on for my family. And according to a survey, she’s not the only grandparent going above and beyond when it comes to looking after their grandchildren. 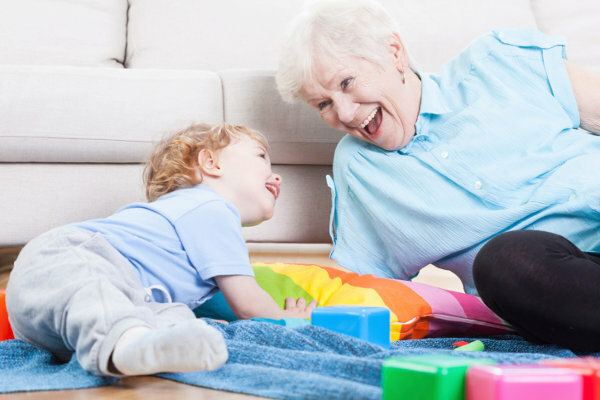 Sixteen per cent of parents now use grandparents for at least some of their child care, according to a survey by childcare industry website careforkids.com.au. Long day care is still the favoured childcare option, chosen by 78 per cent of parents. But most Australian families (55 per cent) now pay more than $300 a week for child care. With the high costs of childcare and nannies, and bursting-at-the-seams daycare centres, grandparents are on call more than ever. It’s led to pleas for government subsidies for grandparents who mind their grandchildren. The Productive Commission’s childcare review is considering whether taxpayers should subsidise nannies, which cost roughly $25 an hour. But 42 per cent of the 1900 parents surveyed by careforkids.com.au want taxpayer-funded subsidies for grandparents and preschools as well. Another controversial idea floated in debate around the Productivity Commission review is making child care tax deductible, and almost three quarters of parents supported that idea. Half wanted greater regulation of childcare fees – which can vary widely from suburb to suburb, never mind state to state. And 62 per cent said employers should be encouraged to offer more work flexibility. According to the survey, the proportion of mothers in the workforce has grown from 42 per cent in 1981 to 66 per cent in 2011. But high childcare costs are forcing some to rethink their options. A separate childcare affordability report found some Australian mums are earning as little as $3.44 an hour when they return to full-time work, after childcare costs are taken into account. The careforkids.com.au survey found 20 per cent of unemployed parents are not working because of the high cost of childcare. Almost a third of employed parents say working is financially unviable. More than half of parents said the present government paid parental leave scheme was appropriate – and 58 per cent disagreed with Prime Minister Tony Abbott’s proposed six-month scheme. How would you change the childcare system to make it better for your family? Tell us below.